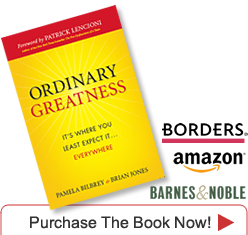 The following is an interview with Pamela Bilbrey and Brian Jones co-authors of Ordinary Greatness: It’s Where You Least Expect It…Everywhere. Ordinary Greatness is not a term most of us have heard. What does it mean? Brian: Ordinary Greatness refers to the characteristics, qualities, skills or efforts that are occurring everyday in our lives and in the workplace that go unrecognized. In other words, everyday people like you and me that are making meaningful contributions; people that are giving of themselves but others, especially leaders, fail to see it. Pam: So it’s these unrecognized acts that most often define ordinary greatness. But it goes beyond that. Ordinary greatness also refers to the unrealized potential of individuals and organizations to fully utilize their passion, commitment and energy. In fact, we believe that failure to cultivate ordinary greatness, the potential of the each person in the organization, is the greatest missed opportunity we see in today’s business world. What is the most important message that Ordinary Greatness has for today’s business world? Pam: That’s an easy question. Brian and I wholeheartedly agree that everything any organization needs to be incredibly successful already resides within that organization. Their existing workforce has the energy, enthusiasm, skill, talents and potential for greatness. The issue is that it is not recognized, celebrated, leveraged and cultivated. Brian: It’s ironic isn’t it? Because it is this ordinary greatness if carefully cultivated that would lead an organization to exceptional levels of productivity and extraordinary results. Ordinary Greatness sounds like a concept that is especially important in today’s turbulent business environment. How did the concept of ordinary greatness come about? Pam: It came from two insights really. First, Brian and I have over 25 years of combined experience in organizational consulting work. We have had the opportunity to work with hundreds of organizations and have seen this theme of overlooking the skill, talent and potential of the existing workforce repeat itself time and time again. So we have been working with our clients to develop innovative strategies for several years now. Then about a year ago we read a Washington Post Pulitzer Prize-winning article called “Pearls before Breakfast.” It’s the recounting of an experiment conducted by the Post which placed world-renowned violinist Joshua Bell incognito in a corner of the Metro station to play his Stradivari to the passing crowd. No matter how much emotional power Bell poured into his performance, commuters hurried by almost without exception, never giving a second glance or taking a few seconds to listen to the music. Bell went largely unnoticed because of the context – no one expected to find this virtuoso playing in the Metro station. Brian: The article reminded us of leaders we know who, because of their busy schedules, frantic lives, and overall hectic existence, walk past greatness every day because it appears so ordinary. As we talked with others we realized that far from being the exception, this tendency has become the norm. Greatness gets overlooked on a daily basis due to how it is encapsulated. Ordinary people do great things in the business environment, but these individuals and their deeds go largely unnoticed because they aren’t the ones with the title, the corner office, or the expertise. From there a book was born. It is a book that is meant to alert leaders to their own blinders that prevent them from recognizing and celebrating ordinary greatness. And it’s a book that is full of compelling stories and examples of how practicing ordinary greatness can leverage the abilities, passion and enthusiasm of an entire organization and drive results. It’s a book that provides leaders with specific strategies and actions to enhance their leadership abilities as well as their personal lives. You write about the five blinders that prevent leaders from recognizing the greatness that is right before them. Can you give an example of several of the most common blinders? Pam: Actor Christopher Reeve once said, “Some people are walking around with the full use of their bodies, and they’re more paralyzed than I am.” Blinders paralyze our ability to see greatness. The five we discuss in the book are: compartmentalization, preconceived notions, personal bias, external focus and busyness. I am not sure that any one is more common than another; all seem to be alive and well. But let’s talk about preconceived notions – forming conclusions based on perception or habit without first obtaining enough facts to make sure our perspective is accurate. We do it because it is comfortable, convenient and doesn’t take as much effort. But it also limits the possibilities and often results in faulty assumptions and bad decisions. It’s not very different than an aquarium filled with fish when clear dividers are inserted. The fish quickly adapt to the limits of the divided aquarium. When the dividers are removed, the fish swim only to where they know the glass dividers have been – no further. To begin the process of removing this blinder, we often advise others to seek new experiences that expose them to situations and people with whom they might never otherwise associate as a way to expand their personal awareness. This form of self-development is a great way to realize that what you think and act on unconsciously is not always valid. Brian: The busyness blinder is one that almost everyone can easily relate to. We are addicted to schedules, timelines and calendars, not to mention cell phones, laptops and BlackBerries. It’s this habit of continually multitasking that eliminates time for reflection and for clearly seeing what is before us. We found an interesting statistic we share in the book: the average speed of vehicles traveling through New York City in 1903 was 11 miles per hour. The average speed of vehicles traveling through New York City in 2003 was 11 miles per hour. Are we really accomplishing more with all this busyness? So now we know about several of the blinders. Do you recommend specific leadership behaviors that can encourage and grow greatness in the workplace? Brian: Yes, there are three categories of leadership behaviors that drive ordinary greatness. The first, setting the context for ordinary greatness, begins with a mindset that leaders are there to serve their subordinates and that leaders need to be visible and accessible to those they lead. Instead of sitting behind a desk or spending the better part of the day in meetings, leaders need to be out in the organization interacting and learning. Second is a focus on promoting ordinary greatness by recognizing and celebrating the day to day actions that make a difference. Another great way to promote greatness is through employee involvement and participation. The third area, cultivating the potential of ordinary greatness, is about uncovering the hidden skills and talents of the workforce. It’s tapping into the unrealized potential of both individuals and organizations to fully use the passion, commitment and energy within them that provides the competitive advantage. It seems that the concept of ordinary greatness has great application for today’s challenging business environment. Pam: Absolutely. In fact, as we were completing the manuscript for the book, the world’s financial structure began a spiral of unexpected turmoil. Almost immediately we began to get calls and e-mails from leaders across the globe asking the question, “How do I lead in such unprecedented and uncertain times?” So we added a final chapter to the book on how to focus on ordinary greatness when we are re-evaluating and redefining everything we know as “normal.” Challenging times can bring out the best or the worst in leaders. The principles of ordinary greatness brings out the best.